The dramatic lip markings are strikingly expressed upon the lateral petals of this plant, the exceptional feature shared by many of the Miss Wonderful plants; it's parent Laeliocattleya Mari's Song is to thank for that quality. 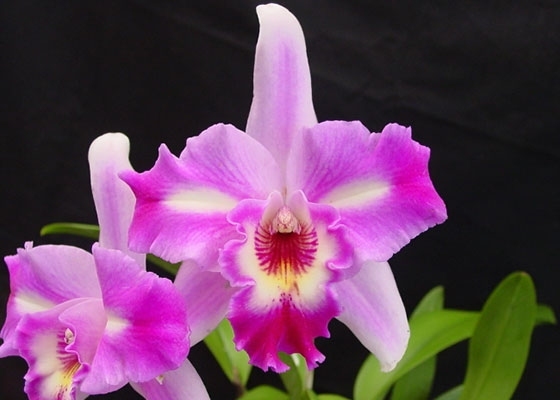 Its other parent, Laelia anceps 'Mendenhall', enlarges and flattens the flower as well supporting it high above the foliage on a slender stem. The flower color is varied intensities of lavender-pink with white markings and undertones. Every year 'Candy Cane' is one of the earliest plants of the Miss Wonderful cross to bloom.Temperature Tolerant. August blooming.